No. 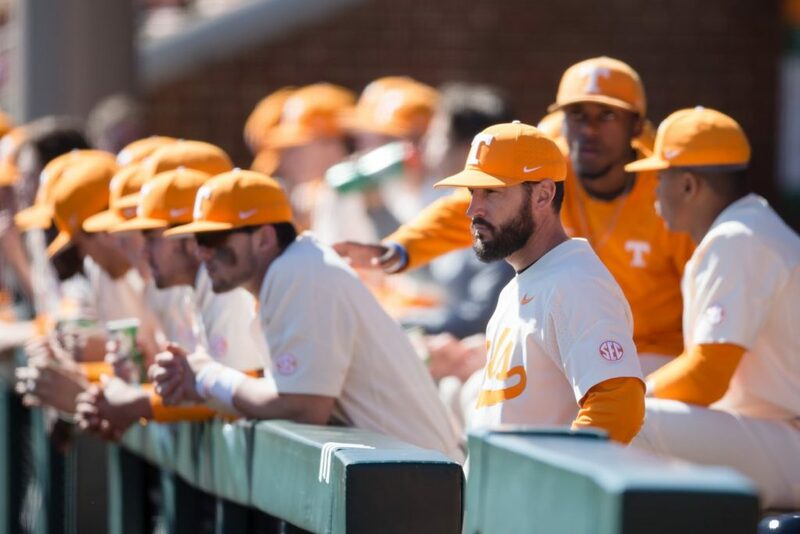 21 Tennessee won its three-game series this weekend, but the team dropped its first game of the season on Sunday afternoon at Lindsey Nelson Stadium, falling to Fresno State 10-7. 35 minutes from the conclusion of Saturday’s suspended game, senior right-hander Will Neely (L, 2-1) received the start for the Volunteers. Fresno State jumped on Neely immediately, scoring four runs in the top of the first. “He seemed to be in the middle of the plate,” Tennessee baseball coach Tony Vitello said. “Will has always been more of a pitcher. He needs to attack, but you can’t live in the middle of the plate against a good offense. Zach Ashford led off the game with a single. A batter later, Ashford scored the first run of the game as Nolan Dempsey hit an RBI double. JT Arruda followed up Dempsey’s clutch hit with an RBI double of his own, scoring Dempsey from second. After Arruda advanced to third on a fly ball, Fresno State third baseman McCarthy Tatum hit a two-run homer to give the Bulldogs a 4-0 lead. Tennessee (15-1) would respond to Fresno State’s (7-5) scoring outburst an inning later, scoring five runs in the bottom of the second. Ricky Martinez was hit by a pitch to begin the inning, and after Luc Lipcius reached on catchers interference, the two were on first and second to begin the inning. Freshman second baseman Jake Rucker then laid down a perfect bunt and was able to reach first base. On the play, a Fresno State throwing error allowed Martinez and Lipcius to score. As the lineup turned over, Justin Ammons launched a ball over the left field wall to tie the game at 4-all. It was Ammons’ second home run of the season. Later on in the bottom of the second inning, Evan Russell hit an RBI single up the middle to give Tennessee a 5-4 lead. Jay Charleston scored on the play after walking and stealing second. As was the case with both teams in game two and three of the series, Fresno State responded to Tennessee’s five run second inning with five runs of its own in the fourth inning. Fresno State hit three consecutive singles in the fourth to drive in two runs. With runners on, Arruda then smashed a three-run homer to extend the Bulldogs’ lead to 9-6. Arruda finished the day 3-for-5 with 4 RBIs and two runs scored. The big inning would be the end of Neely’s day, who allowed eight runs on nine hits in 3.1 innings pitched. Neely walked one and struck out three. Tennessee was unable to battle back from the deficit, but not for a lack of effort. The Vols had the bases loaded with two outs on three separate occasions and were unable to produce a run each time. UT left 12 runners on base. Following its first loss of the season, Tennessee now turns its attention to a mid-week series with UNC Asheville. The two teams will play on Tuesday and Wednesday of this week. First pitch on Tuesday is scheduled for 6 p.m. ET while Wednesday’s game is scheduled for 5 p.m.
“We’ll put in a lot of homework Monday and make sure we’re ready on Tuesday,” Vitello said. Take a look at our write-ups of the Vols’ first two games of the series on the following pages. What are the Vols' Odds to Win 2019 SEC Tournament?